One of the most pleasant, accessible short hikes on Ontario’s famous Bruce Trail begins here, at the end of Cathedral Drive in Hope Ness, on the Bruce Peninsula. And right at the end of my driveway too, by the way. Depending how leisurely you want to walk, Hope Bay is more or less a two-hour hike south. Or, conversely, a two-hour hike north from Hope Bay to this point. If you start here, about 15 minutes in you’ll want to take a side trail to the cliff edge overlooking Hope Bay, reaching out in the distance to the broad, blue expanse of Georgian Bay. I try to walk to the lookout, which I regard as a very special place, at least once a week. A few days ago on the way I saw the trilliums were starting to bloom. But I didn’t have my camera with me. Sometimes I would just as soon let the fleeting moments of natural beauty have their freedom, rather than capture them. But this morning, to keep a promise, (Hi, Julie) I took a short walk in with my camera to take a few photos of the Province of Ontario’s official flower to post here. Trilliums are mostly white. But I saw quite a few of the rarer, delicately mauve variety. This post was definitely not inspired by today’s daily prompt, catapult. this stand first in the 1970s. Scandinavia as far as Finland. names across the ocean the way they moved place names. Ah, yes. 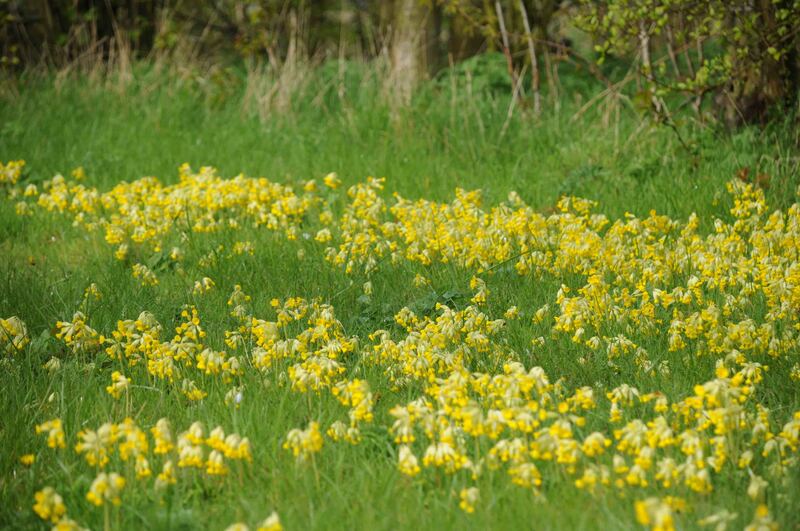 I see by your pic link that what I called Dutchmen’s britches are Cowslips. What I call them maybe goes back many years to a local friend, Wilma Butchart, who used to live where I am now. There’s lots of them on the property. Any idea what the red markings on at least one tree and red ribbons back there on the Jack Post trail are all about? About 500 yards in.